League of Legends has become an online, multiplayer, sensation since its release back in late 2009. At present it’s estimated that 100 million unique players play the game at least one time per month, and it has the most online game hours played of ANY game. It also runs pro-tournaments in LA and Berlin culminating in a World Championship playoff with prizes of over $1million. The last one attracted 32 million online viewers. LOL fans will be stampeding to buy a set of these POP! 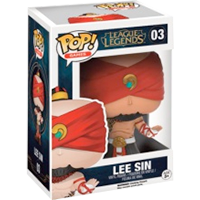 The Lee Sin POP! vinyl figure stands around 10cm tall.